The 118th Brawl of the Wild rivalry takes center stage on UM News this week. 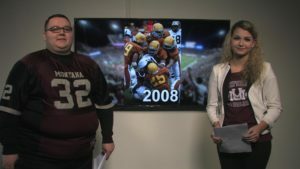 You’ll learn Brawl Facts, go along with the equipment team and hear from a die-hard Griz fan. This show was produced by Andrea Dobbins and directed by Justin Jackson. Go Griz!